Create a brotherhood of assassins in this T-rated mobile game. Assassin’s Creed: Rebellion is a free-to-play strategy role-playing game (RPG) set in the popular Assassin’s Creed universe. While most Assassin’s Creed games (those available for home consoles) are rated M -- and deservedly so -- Assassin’s Creed: Rebellion is rated T for Teen on Android and 9+ on iOS, making the game ok for slightly younger players (in our opinion, the T rating is more appropriate than 9+). Assassin’s Creed: Rebellion takes players to Spain in the 15th century, and asks them to create a brotherhood of highly trained assassins capable of eliminating the Templar threat. Players can complete missions to progress the story and eliminate enemies, and then build and improve their brotherhood’s headquarters with the materials they gather along the way. Players can take up to three assassins with them into each mission. During a mission, players can explore locations room by room by sending the right assassin into each room depending on the character’s skill set and the challenges the room contains. For instance, if a room is filled with traps, they’d want to send in an assassin skilled at disarming them. Each action players can potentially take has a different likelihood of success, which players can clearly see before deciding what to do. This lets them strategize their plan of attack before putting their team in danger. In between missions, players can spend resources on new rooms for their headquarters. Each room has a different purpose. For instance, one can be used to train assassins, which increases their stats. Users will collect all sorts of resources as they play, including DNA fragments that allow them to recruit new assassins to their brotherhood. The game includes over 40 characters at launch, combining characters from previous Assassin’s Creed releases with completely new ones. 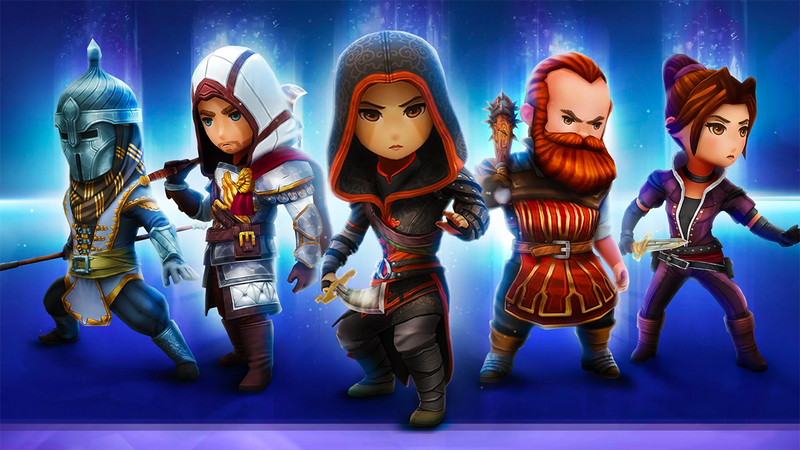 If your kids have always wanted to try an Assassin’s Creed game, seeing some familiar faces from the universe in this mobile game (like Ezio, Aguilar, and Shao Jun) is a nice substitute to actually letting them play the main games. Assassin’s Creed: Rebellion is available to download for free on iOS and Android devices. The game includes optional in-app purchases. Users can also subscribe to a monthly subscription service, which gives them access to increased rewards and other bonuses. Check out the first 22 minutes of Assassin’s Creed: Rebellion in our SuperParent First Look below to see if your teens would enjoy this one.